This trap is designed from the regular Mcphail trap design for economical and budgetary purpose. It is used in monitoring fruit flies. 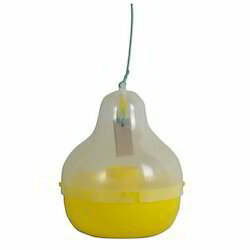 Fruit Fly Trap offered comes in quality construction finish and provides highly effective usage in trapping flies. An all-natural, non-toxic and mess free unit designed to eliminate flying insects . The 4 hole venting lid fully exposes vapors of the attractant in order to lure flies into the trap where they are caught instantly. This is glass trap. Use in all of fruit and vegetables flies. All types of lure adjust in this trap. Validity period of glass- 5 years. 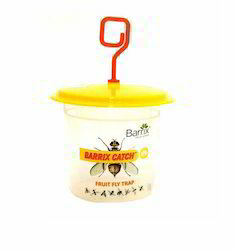 We are engaged in offering a quality approved range of Fruit Fly Trap. Bestowed by a progressive production setup, we have attained specialization in presenting highly durable Fruit Fly Trap to our patrons.